Hey friends! 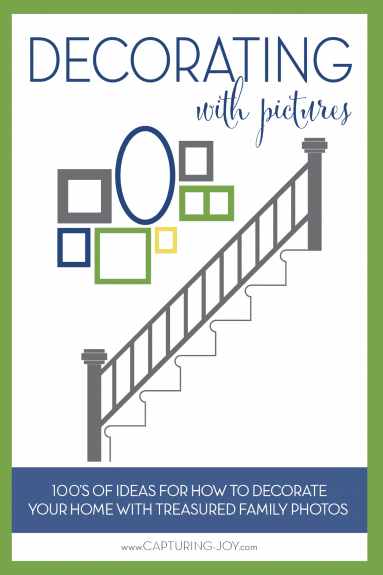 I am so excited to be participating in Capturing Joy with Kristen Duke’s Decorating with Pictures Series! 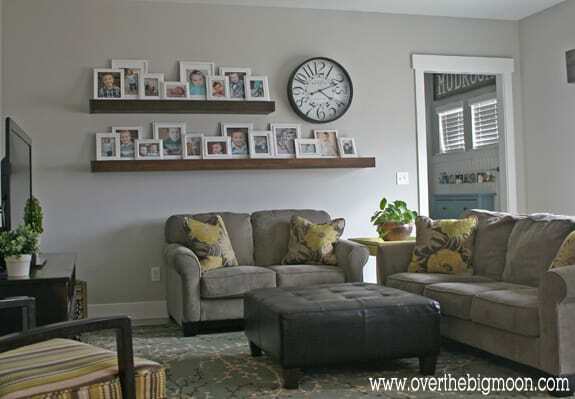 I have been really excited about how this Floating Shelves Picture Wall turned out in our Family Room, but I hadn’t gotten around to sharing it with you all yet! If you haven’t been to Kristen’s site, you need to head over and check out all her amazing posts on photography tips, family picture tips and more! 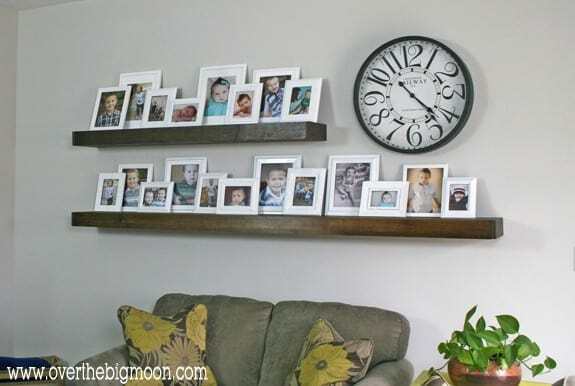 One of the main reason’s I haven’t posted my Floating Shelves Picture Wall is because we just moved into this house 6 months ago and I haven’t completed my family room makeover yet! So, aside from this wall, consider this my before pictures of our Family Room and stay tuned for the updated family room in a few months! 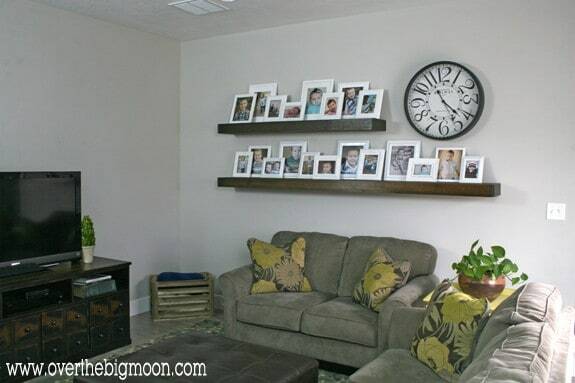 I really wanted an Industrial/Rustic feel in our house, so I went ahead and built some floating shelves using the amazing tutorial from the Shanty’s! Then I gathered all the frames I had around and bought a few new ones and painted them all a bright white from Rustoleum! Then filled them with the beautiful faces of my kids and we were good to go! I love having a wall of TONS of pictures in my main living area. I’ve never had this many pictures in my house displayed and I don’t know why! I couldn’t image my house any other way now! It’s so fun to look back at my kids at different ages! I love that people compare their looks and that you can see their same personalities in their faces even when they were little little! If you spied my Ikea Mudroom in the back and want more details you can view details here! 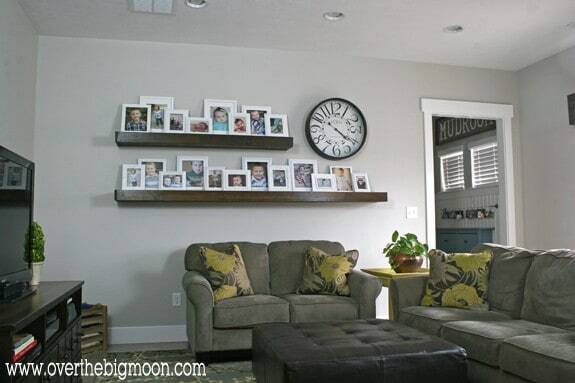 Be sure and check out all the posts that are a part of Kristen’s Decorating with Pictures series! There are SO many good ideas from so many talented people! 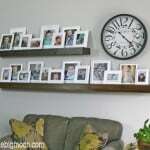 Wow those shelves look amazing! I’m so obsessed with how these turned out! Can’t wait to try them out! I love this. I’ve been eyeing that tutorial on Shanty2Chic for awhile now and may just have to tackle it now! That clock of yours is gorgeous too!